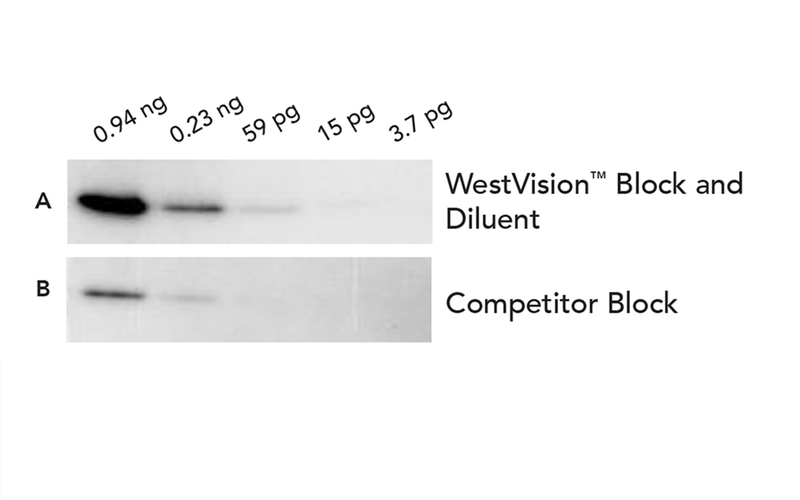 WestVision™ Peroxidase Polymer antibody conjugates bind primary antibodies of mouse (WB-2000) or rabbit (WB-1000) origin for western blot detection. The high-affinity interaction produces a sharp signal and low background. The conjugates are based on a proprietary method of polymerizing enzymes and attaching these polymers to antibodies. This allows a higher density of enzymes to access a target with minimal interference. The result is an excellent signal-to-noise-ratio in western blot detection. Use WestVision™ Peroxidase Polymer antibody conjugates when you need the sharpest signal and lowest background possible in western blot detection. Human recovered plasma probed with Rabbit Anti-Transferrin and detected with WestVision Horse Anti-Rabbit IgG. Developed with DuoLux chemiluminescent substrate. Membrane blocked with 1x Casein.